Finmarket is a Crypto, FX and CFD broker owned and operated by K-DNA Financial Services Ltd, which is a company registered in Cyprus and authorized/regulated by the Cyprus Securities and Exchange Commission (CYSEC) under license number 273/15. Their listed address is 56, Griva Digeni, Anna Tower, 1st Floor, CY-3063 Limassol, Cyprus. JVS LTD is a Tied Agent of K-DNA Financial Services LTD and is authorized to work under Licence number 273/15. Company Address: City of Sofia 1606, 30-32 Totleben Blvd., floor 1, office 1. In my opinion, the account types are not the best in terms of structure. What I mean by that is the minimum deposit is $250 (Mini Account), which is fine but after that, things start going uphill pretty fast: 1K for the next account (Standard), 10K for the Mini-VIP and up to 100,000 USD for the Premium. What’s more disappointing is that you need to deposit 20,000 USD to get Daily Market Reviews. This is something that’s actually offered for the lowest account by most notable brokers. Negative Balance Protection! This means that your account will never go below zero, meaning that you will never owe money to the broker. If you’re wondering – Yes, that is possible with many FX/CFD brokers because most don’t have Negative Balance Protection. Having this feature adds an extra layer of protection; I know that blowing your account is bad but it would be worse to blow your account and owe some money to the broker. It’s been a while since we’ve seen a regulated broker, especially one that has been authorized since 2015. However, it must be noted that the owning company is regulated since 2015, not Finmarket as a broker and in fact, we don’t know for sure when they launched; according to some online sources they have launched in 2016, but we cannot confirm that. Notice! This Broker has been rated average by our editorial Staff. Start your trading career with a Top Rated Broker Now!. Should I Open An Account With Finmarket? Right away we can tell we are dealing with a serious broker that is focused on the things that matter like regulation, trading conditions and reliable trading platforms rather than declaring they are The Best. The available platforms are Meta Trader 4 (the go-to platform of many pros) and WebTrader powered by Panda Trading Systems. The latter doesn’t need any download, thus you can access it from all over the world, even if you don’t have your personal computer with you. On the other hand, Meta Trader 4 (MT4) requires a small download and installation but in return, you will get lots more features and a professional looking platform (drawing tools, full technical analysis and advanced orders). The education material is not impressive but it covers the basics and has some good Meta Trader 4 tutorials about installation and setting up the platform. You will also find a bunch of trading strategies, which are well explained but, of course, no one can vouch for their actual results. In fact, Finmarket clearly states that all educational material is provided by a third party and is solely for promotional purposes. The account structure feels a bit geared towards deep-pocketed traders because after the minimum $250 deposit (Mini), the bar goes too high: $1,000 for the Standard account, $10,000 for the Mini-VIP, $20,000 for the VIP, $50,000 for the Mini-Premium and $100,000 for the Premium. I am not sure the extra perks are worth the large investment but that’s for each individual trader to decide. Overall Finmarket looks like a trustworthy brokerage (the owning company is regulated since 2015), with a good choice of platforms (MT4 Desktop and Panda WebTrader) and satisfactory educational material that includes platform tutorials and trading strategies. However, the high deposit requirements may keep a lot of traders away unless they go for the minimum deposit ($250), which is the average for the industry. We couldn’t locate any complaints about Finmarket, which is weird if they are active since 2016 (as some online sources say) but it’s rather normal if they launched in 2018. All we could find were some awkward comments, which only said: “Good”, “The Best” and “Very Happy”. Really, I don’t know what to make of this; I don’t know if these are real comments or posted by someone affiliated with Finmarket. Anyway, we couldn’t find any horror stories about scammed clients or anything similar. None of the major regulators have warned against Finmarket or issued any fines. If anything changes in this regard, we will update as necessary. Unfortunately, Finmarket doesn’t have an FAQ section so I had to turn to their Terms And Conditions to learn about the withdrawal procedure: the available methods are credit cards, wire transfers, Skrill and Cash U. The fees are high (find the exact fees below) and the processing time is not specified. The client will have to send identification and proof of residence documents in accordance with KYC rules. By far the best Extra feature is the Negative Balance Protection, which means that your account balance will never go below zero, so you will never owe money to the brokerage. What’s good is that you can benefit from this feature even if you hold the lowest account with Finmarket. The website doesn’t have an FAQ section, so the information is hard to find and I had to go through tons of Legal Documentation for this review. The website is only translated in English, French, and Deutsch. Mobile platforms are available but Demo accounts are not. Their asset basket is huge. All the usual asset classes are available (currency pairs, stocks, indices, commodities and cryptocurrencies) and each category is filled with tens of individual items. The crypto offering is one of the biggest I’ve seen, including Bitcoin, Bitcoin Cash, Ripple, Ethereum, Litecoin and many more. Leverage for crypto is 1:1 and for Fiat currencies up to 1:100. The spread for EUR/USD is 3 pips, which is average for CFD brokers. Withdrawal methods are credit cards, wire transfers, Skrill and Cash U. The minimums are not specified and neither are the processing times. The client will have to complete a Withdrawal Form available in Finmarket’s Legal section. According to their Terms And Conditions (Section 19.9), the company reserves the right to change/increase/decrease or cancel the withdrawal fees, which are as follows: $35 for credit cards, $40 for wire transfers and Skrill and $45 for Cash U. There’s also an inactivity fee of 45 Euro charged monthly. An account is considered inactive after 30 days during which the client didn’t make a deposit/withdrawal or trade. Live chat support was unreachable during 2 visits (in 2 separate days), so thumbs down for that. Negative Balance Protection, CySEC regulation, and Meta Trader 4 for trading. These are all positive extras and I wish that more brokers would implement these features. However, the rest of Finmarket’s offering is relatively weak. Notice! : This Broker has been rated average by our Editors and Members. 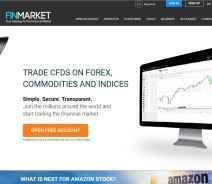 Start your trading career with a Top Rated Broker Now!.